Join us from June 29th to July 2nd on the sidewalk in front of the United States Supreme Court for the 16th annual Fast and Vigil to Abolish the Death Penalty. To commemorate the four years from 1972 to 1976 when our country did not have a death penalty, we spend these four days each year providing a continuous presence at the Supreme Court. We have speakers who were on death row and were exonerated, others who have had family members murdered, and some who have helped abolish the death penalty in their states. In addition to networking and learning, we help to inform the thousands of people who pass by the court about the problems with the death penalty and what they can do to help us end it. During the month of October a photo exhibit by Scott Langley will be on display at Tapp’s Art Center, 1644 Main Street in Columbia. Sponsored by SCADP, the display will portray the events leading up to the execution of Troy Anthony Davis of Savannah, GA. This case caused massive international protests. Among many others, Pope Benedict XVI, former President Jimmy Carter and Archbishop Desmond Tutu called for clemency for Troy Davis. On Thursday, October 18th from 6 to 8 pm SCADP will host a reception at Tapp’s Art Center. Rev. Neal Jones, Psy.D., Minister at the Unitarian Universalist Congregation, will talk about the death penalty, its ramifications in a civilized society and why it should be abolished. Refreshments will be served. The event is free and open to the public. For more of Scott’s photos, check his website, and please come to Tapp’s Art Center! As part of Amnesty International’s South Carolina State Meeting, SCADP board members Ron Kaz and Anna Shockley will conduct a workshop on the death penalty on Saturday, March 10 at 4:00pm. The workshop will take place in room 304 of USC’s Russell House and is free to the public. Please come, pick up some fact sheets and a free button or bumper sticker, and find out what you can do to help SCADP and Amnesty International with current campaigns and to move South Carolina closer to abolishing the death penalty. To find out more about the workshop, email anna(at)charlestonpeace.net. For more information about Amnesty International and the State Meeting, which will take place that Saturday and Sunday, click here or email Kali at esancy(at)email.sc.edu. Juan Melendez is a member of the Board of Directors of NCADP and a tireless activist working to end the death penalty. He spent seventeen years, eight months and a day on Florida’s Death Row for a murder he did not commit. He was exonerated in January 2002, when the real killer was found. 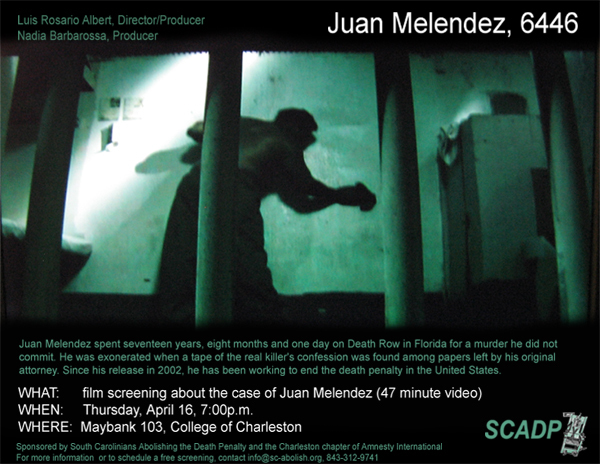 If you would like to show the 47 minute video about Juan’s ordeal, please contact us at info(at)sc-abolish.org or 843-312-9741. Please also contact us if you would like someone to talk to your group or class about the death penalty and what you can do to end it in South Carolina. If you are a member of Amnesty International in South Carolina or are thinking of joining, please come to our general membership meeting on the campus of USC in Columbia on March 10th and 11th. The meting will focus on AIUSA’s major campaigns (Demand Dignity, Security with Human Rights, Immigrant’s Rights, Death Penalty Abolition, and Individuals at Risk), with members of SCADP’s board conducting the Death Penalty Abolition workshop. There will also be a demonstration at the State House demanding the closure of Guantanamo. Click here for more information, or email Kali Esancy, esancy(at)email.sc.edu. The Death Penalty Information Center’s Richard Dieter will discuss recent developments in the death penalty, the factors behind the decline in its use, and the implications for South Carolina. Dieter has served as Executive Director of DPIC since 1992 and is an Adjunct Professor at the Catholic University School of Law. A graduate of the Georgetown University Law Center, Dieter was one of that university’s first Public Interest Law Scholars. He has worked for many years on issues related to human rights and the death penalty. He prepared reports for the U.S. House of Representatives and testified at numerous legislative hearings. The author of many articles and reports on the death penalty, Dieter is frequently quoted in national and international media. Mr Dieter was invited by Charleston’s Amnesty International Group 168, and his presentation is co-sponsored by SCADP, the South Carolina ACLU, the Criminal Law Society of the Charleston School of Law and the College of Charleston’s Amnesty International student group. SCADP and the Amnesty International chapter at the University of South Carolina would like to thank Bill Pelke, an internationally famous expert on the death penalty, for coming to tell his remarkable story of forgiveness and healing to an audience of students and community members this Wednesday, October 21, at the University of South Carolina. Bill is the president and cofounder of the Journey of Hope … from Violence to Healing and has authored a book by the same name. His story is the subject of three documentaries, and he has appeared on “Good Morning America,” the “Oprah Winfrey Show,” and many other programs. He has been interviewed by NPR, Vatican Radio, and Pacifica. Bill is a board member of the National Coalition to Abolish the Death Penalty and served as chair from 2004-08. He is also a founding and present board member of Murder Victims Families for Human Rights and an incorporating board member of Murder Victims Families for Reconciliation, and he serves on the boards of Alaskans Against the Death Penalty and the Journey of Hope. He is a cofounder of the Abolition Action Committee and the annual Fast and Vigil at the US Supreme Court. In 1985 Bill’s grandmother, Ruth Pelke, was murdered by four ninth grade girls. Paula Cooper, who was fifteen years old at the time of the murder, was deemed to be the ringleader and sentenced to die in the electric chair by the state of Indiana. Originally supportive of the judge’s decision, Bill went through a spiritual transformation which led to forgiveness and healing. Bill realized the death penalty was not the proper solution and worked successfully to have Cooper’s sentence commuted to 60 years in prison. She is still in prison today, but no longer under the sentence of death. Bill has dedicated his life to abolition of the death penalty. This Friday, September 23 at 5:00p.m., the USC chapter of Amnesty International will host a teach-in about Troy Davis in Gambrell 153 on the USC campus. Mr. Davis has been on death row in Georgia for the 1989 murder of Savannah police officer Mark Allen MacPhail. He is almost certainly innocent of that murder, but remains in grave danger of being executed. SCADP co-chairs Ron Kaz and Anna Shockley will be the speakers.